The International Strategic and Security Studies Programme (ISSSP), a unique programme at the National Institute of Advanced Studies (NIAS) in IISc campus released four related reports on Small Satellites, Space War and Identification of Uranium Mill sites. The four reports were released today by Dr Baldev Raj, Director of the NIAS and critiqued by Prof YS Rajan and Vice Admiral RN Ganesh. Introducing the reports, Prof Rajaram Nagappa highlighted the focus of them and their utmost importance to India’s national security. Dr Baldev Raj releasing the reports underlined the importance of the National Institute of Advanced Studies based in Bangalore but providing vital inputs and concrete recommendations to India’s security. He mentioned with pride that the NIAS is truly interdisciplinary and a cradle of good research work. The report titled “The Promise of Small Satellites for National Security,” authored by Prof Rajaram Nagappa provides a survey of small satellites that can be employed for military ISR requirements. The report also examines satellite and launch history of ISRO and concludes while ISRO has demonstrated technological capabilities, there is a lack of capacity in the country to meet the military space requirements. The report also carries a survey of small satellite launch vehicles and determines a launch vehicle capable of placing a small satellite of 350 kg mass in an orbit around 500 km can be configured using available rocket/missile stages in the country. The advantage of using readily available and flight-qualified stages is that the development time can be effectively reduced. For generating a faster turn around of the small satellite launch vehicle and satellites, increased industry involvement is essential. Vice Admiral Ganesh commenting on the report said, “despite the constraints, the ISRO has gone ahead and undertaken a commendable job relating to both satellites and rockets.” According to him, the primary military requirement is for communications – imagery, surveillance, electronic warfare etc. According to the report, one needs more frequent revisits, especially as mobile platforms like ships and other transport systems may have to be tracked. As one would like to track such objects at night or under cloud cover conditions, one has to use optical imaging satellites as well as radar imaging satellites to get good imagery under all conditions. Electronic intelligence satellites (ELINTs) have antenna arrays to monitor electrical radiation from emitting sources. This will help in locating such sources (ships, radar stations and other such installations). The report also stresses the importance of technology. Nano-satellites in the mass range of 1-10 kg or micro-satellites in the mass range 10-100 kg or small satellites 100-1000 kg can be designed and employed for such applications. Small satellites will perhaps be more suited for the purpose of ELINT, optical and radar imaging to meet the 24×7 ISR requirements. A constellation of 15-18 satellites will be required. More satellites in the constellation can further reduce the time gap between revisits. 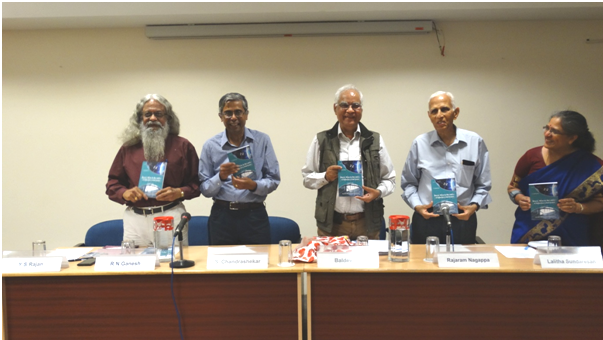 The second report titled “Space, War and Security: A Strategy for India” authored by Prof S Chandrashekar, presents a critical appraisal of Indian capabilities to monitor and use the space environment for various military tasks. These include Command & Control, Intelligence, Surveillance & Reconnaissance as well as a number of other space functions such as navigation and weather services. It makes a strong case for a new strategy that integrates these components into a coherent national strategy that is relevant for the country at this point in time. The formulation and implementation of such a strategy will also need a significant enhancement in capabilities to build and launch satellites. These are identified in some detail. India also needs a significant augmentation of its ground based radar and optical tracking facilities in order to monitor the happenings in space on a real time basis. Finally the report addresses the need to re-organize and restructure our entire national security complex to be aligned to this new global reality. Two more reports, titled “Identification of Uranium Mill sites from Open Source satellite Images” & “Estimating Uranium Mill Capacity Using Satellite Pictures” authored jointly by S. Chandrashekar, Lalitha Sundaresan & Bhupendra Jassani focus on the use of openly available satellite imagery for the identification of Uranium mills.